The long and vibrant tradition of art-song in England has seen many great composers from Finzi to Vaughan Williams, Gurney to Moeran and Warlock and countless more, supported for many years now by the English Poetry and Song Society. This is the fourth of four albums of live EPSS concert performances made by Dunelm for private use and now on general release due to demand; it contains works by major composers and several talented members of the EPSS, some of whom have recently become much better known and successful, including Jeffrey Whitton, Laura Shur and Sarah Rodgers. Based around music by Ivor Gurney, E.J. Moeran and Sulyen Caradon, the recital is wide ranging and a fine demonstration of English art-song. These EPSS recordings were made on portable recording equipment and with less than ideal microphone placement and are not to our usual modern standard. However they contain fine performances and many very unfamiliar and exquisite songs, which will delight any lover of late-Romantic vocal music. 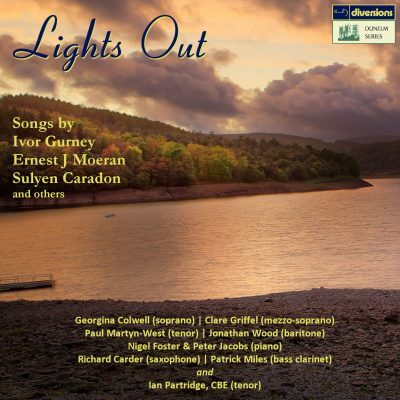 Lights Out: English Art-Song is released by Divine Art (DDV 24165) on 18th August.